RMUTP was established on 27 February 1975 when the “Vocational Education and Technology College” Act was announced on the Royal Gazette and came into force. The Act aimed to create vocational teachers with a bachelor’s degree to teach vocational education at vocational level, undergraduate level and advanced vocational certificate level. The Act also intended to promote vocational research activities and provide technical services to the communities. Over the years, the Vocational Education and Technology College had developed its teaching techniques, produced quality graduates and provided excellent services to the society. 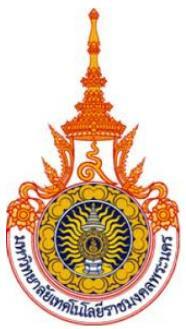 It was not until 15 September 1988 when HM the King granted a new name to the college, which then came to be known as the “Rajamangala Institute of Technology”. With the National Education Act, B.E. 2542 (1999) aimed to decentralize management in education institutes to make them more independent and flexible to handle their own affairs under the university council, Rajamangala Institute of Technology subsequently amended the law governing the institution at that time before enacting it as the “Rajamangala University of Technology Act,” which HM the King signed on 8 January 2005.The law, announced in the Royal Gazette ten days later before coming into effect on 19 January 2005, combines all campuses nationwideinto nine Rajamangala University of Technology ; namely, RMUT Thanyaburi, RMUT Krungthep, RMUT Tawan-ok, RMUT Phra Nakhon, RMUT Rattanakosin, RMUT Lanna, RMUT Srivijaya, RMUT Suvarnabhumi and RMUT Isarn. The intention is to turn these nine universities into science and technology university offering advanced vocational training in undergraduate, graduate and PhD levels to accommodate vocational students and to provide education opportunities to those graduated from community colleges. The integration is aimed to provide an opportunity for students to continue vocational study at the undergraduate level. All nine RMUT have been under the supervision of the Office of Higher Education Commission, Ministry of Education. A leading university for diverse careers, producing exceptional technological specialists and offering international value. To provide high –quality professionalism at the higher education level by focusing on science and technology and to make sure that our graduates are ready to enter a job market. To maintain art and culture and to conserve the environment.